VTN, the largest carrier in Vietnam, owns and operates the nation's backbone network, which connects 64 provinces via three sub-networks: VTN-1, with its network operations center (NOC) in Hanoi; VTN-2, servicing the Ho Chi Minh City area in the south; and VTN- 3, controlled via Da Nang. VTN, the largest carrier in Vietnam, owns and operates the nation's backbone network, which connects 64 provinces via three sub-networks: VTN-1, with its network operations center (NOC) in Hanoi; VTN-2, servicing the Ho Chi Minh City area in the south; and VTN- 3, controlled via Da Nang. In addition to providing inter-province connectivity to local carriers, VTN delivers business services to banks, corporations, and small to medium enterprises (SMEs), including virtual private networks (VPN), leased lines, voice, and video conferencing. “VTN has deployed over 10,000 units of RAD’s multiservice access platforms (MAP) and Last Mile products to deliver these services,” described Namson Tran, Managing Director of NTCOM VN, RAD’s distribution partner in Vietnam, which supplied the devices and oversaw their implementation. The installed base includes a wide range of CPE (customer premises equipment), aggregation nodes and network edge devices. RADview-EMS is a Java-based, carrier-class element management system for Windows and UNIX environments. It manages RAD’s TDM and next-generation devices using distributed client/server architecture and features advanced FCAPS (Fault, Configuration, Accounting, Performance, and Security) capabilities, accessible via a Web- or SNMPbased agent. 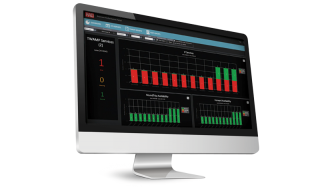 Providing visual network representation with an intuitive GUI, RADview-EMS allows easy configuration, troubleshooting, diagnostics, and statistics collection by remote VTN operators. Each of VTN’s three sub-network centers in Hanoi, Ho Chi Minh City and Da Nang is equipped with a RADview-EMS platform to autonomously manage VTN-1, 2 and 3, respectively. This includes remote provisioning and fault monitoring throughout the network. The three RADview NMS stations are interconnected to allow complete visibility across VTN’s footprint; management authorization for each station, however, is restricted to its respective sub-network. Within the sub-network domains, RADview platforms allow VTN NOC personnel to define access levels for individual network elements according to menus, IP address range and other criteria. "VTN has deployed over 10,000 of RAD’s products… The large variety of products and services over a vast geographical area can't be operated and administered without a carrier-grade network management system"
"Not only does RADview ensure seamless operations, it also saves VTN the cost of additional disaster recovery software tools and expensive storage equipment"
Ofer Rachman, General Manager, RAD Far East Ltd. The point-to-multipoint devices can broadcast any traffic combination from a single input to numerous destinations and provide non-blocking cross connect for up to 120 lines. 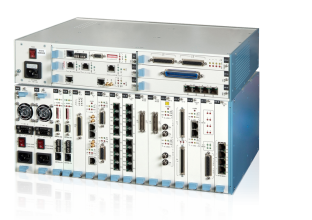 The DXC family modular digital cross-connect units support E1/T1 conversion, inverse multiplexing, signaling monitoring, grooming of fractional traffic, and transmission of T1 circuits over E1 lines.